On many railway layouts, one of the most popular cameo scenes involves the emergency services [police, fire and ambulance] and, when modelling these within a certain period, the key to realism lies in getting the uniforms and equipment correct for the time. This article will consider modelling the Fire Service in the ‘50s and ‘60s. After the Second World War, the Fire Service entered a period of significant change. Much of its equipment was outdated and worn out and modernisation became the order of the day, although these changes took a long time to be seen everywhere. Nevertheless, more efficient equipment was required to save lives in post-war society. I have always loved the fire brigade and have a big collection of models and books about it, but nearly all of us have been impressed by a big red machine hurtling down the road at high speed with its lights and sirens blaring. Those of a certain age may remember them with bells too and they were very much the standard in the ‘50s and ‘60s. Unlike today, the uniform in the ‘50s and ‘60s was rather basic and crews had to be very careful when in a fire because the clothing they were wearing was quite flammable. The colour of the uniform was a dark blue/black with black leggings and black boots. The tunics tended to be made of wool. Station Officer tunics carried silver epaulettes to identify their rank. Firemen wore their axe on the left hand side of their uniform and many brigades based their uniform on the London Fire Brigade. The helmet was black, not becoming yellow until the ‘70’s. Station Officer and superior ranks had white helmets. The rank of a firefighter could either be told by the number he had on his tunic or his helmet. Sub Officers up to Chief Fire Officers were identified by lines on their helmet: two red lines on a black helmet for the Sub Officer, then white helmet with black lines for more senior officers. 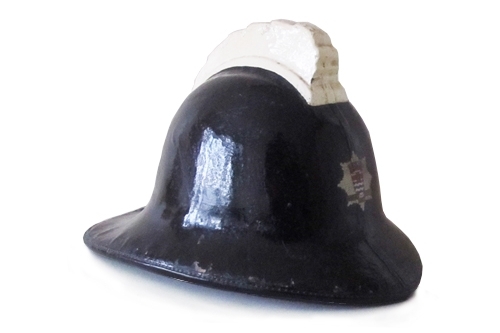 Introduced around 1957, the Cromwell 'LFB Pattern' 2010 helmet carried on the 'stepped comb' of the previous style of helmet but with a lower profile. This style became synonymous with the Brigade nationally and continued in service well into the 1970s. Much cherished by firefighters, many were painted yellow when the new regulations for helmets came into force. When local fire brigades were originally set up they didn’t have a purpose-built building to store their equipment and so it was kept either in a barn, a shed or some other suitable place. Insurance fire brigades however had their own buildings to store their own fire engine and equipment in. It’s hard to date when each part of the UK had their first purpose-built fire station but records can found in the archives. There are various different types of fire station although the most common type is a two bay station where sometimes only one fire appliance is housed. However, some areas just have a one bay station. What all have in common however is an office/watch room which directs the watch (the crew on duty) where to go and advises on the geography of the area. All have equipment stores, etc., too. Obviously, some areas will have very much larger stations with up to twenty bays: these will be found in the bigger cities only though.. There are many different types of fire engines; some have a dual role whilst others have been built for certain jobs. There are various makes and models and not all are made in the UK but have been built by different companies around the world. The colour of a fire engine has not always been red but other colours like green, grey, yellow, white and silver have been used. Private brigades, airports and the armed forces have their own types of fire engine, some bought second hand and others new from special manufactures. This was one of the main work-horse fire engines, commonly seen until it was replaced by the Dennis F12. There are two of these on the SRMG Elsbridge layout. From the above illustration, you can see that it looks more like the modern fire engine of today. There were two types of this model with the control for the water pump being on the side and not the back. Though not a fire engine in it own right, this type of support lorry would carry equipment to rescues that were not carried on the main fire engine. The World Encyclopaedia of Fire Engines and Fire Fighting by Neil Wallington. It is worth a visit to a fire brigade museum or fire station open-day as you can learn a lot more from that to assist with modelling. The internet too is an obvious source of further information. What manufacturers make models ? This is just a small example of what I know is available and there are many more makes out there.